It's got to be destiny that brings people to labor at Goodman Building Supply nothing else could explain it. 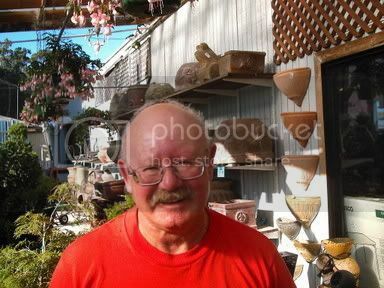 Alan is an essayist, a philosopher, a novelist, an artist with a BFA, and an expert in the garden department. "An Airline Passenger's Guide To Survival"
why is life insurance sold at the airport? Any frequent fliers out there? Congratulations . . . your plane hasn't crashed yet! For a nation constantly on the move, meeting the demands of living in a fast paced society requires more rapid modes of transportation. And airline travel is the most popular way to cover long distances in the shortest possible time. This is spectacular technology as most flights are very uneventful and millions of passenger miles are logged almost completely without incident. People think nothing of flying across the continent every week on business, or circling the globe on vacation. Yesterday's skiing trip has become a weekend in Bali! Yes, we've come a long ways from unpressurized cabins and noisy, piston engines, to an international fleet of huge jumbo-jets that fly quietly and effortlessly high above the clouds at nearly supersonic speed. This is dazzling technology carrying a mobile population of world travelers in comfort and deluxe accommodations, and state of the art travel is taken for granted. However, events do take place that make headlines despite careful maintenance and rigorous safety standards. And these are aspects of flight that no travel agent would care to mention. Incidents pop up that may cause beads of sweat to run down the face of a harried pilot. A pesky air pocket may result in a rapid dive---with a swift descent of 20,000 feet before control is regained. Or power may be lost and the plane loses precious altitude before the engines can be re-started. These and many other unforseen conditions create even more stressful moments---despite the best of precautions and redundant safety systems. The unfortunate reality is that some flights can have a scary episode that makes the evening news...while other events become spectacular situations that end up making a footnote in aviation history. As an air traveler and a sophisticate, there are a few very important steps you can take to increase the chances of safely reaching your destination. Take heed and follow these recommendations, for such important tips will help to maximize your ability to survive in a world where nothing may be taken for granted. One of the first things you should contemplate to ensure your survival is just where you choose to sit during the flight. This is only one of many decisions that must be rendered before boarding and should be considered well in advance of purchasing your ticket. So, even before you walk onto that beautiful jumbo-jet and entrust your fate to a bunch of smartly-dressed strangers, remember the two most important bywords of the serious airline passenger: be relaxed! When you arrive at the airport, always allow sufficient time for each step of your pre-flight activities and do everything necessary without fail! Due to current international conditions, you can assume that a few evil and deranged souls may also book passage and attempt to perpetrate certain antisocial acts that are not exactly to your benefit. Sadly, this is in addition to all the other uncertainties that may occur---which we'll get into later---and make it an imperative that you fully prepare for any and every eventuality. And this means that you must follow certain procedures that are not listed in any travel guide before you board that plane! After parking your car and checking in your baggage, there are two required stops that must precede your boarding. The first is a visit to the airport gift shop to make a very important purchase. Here, you must obtain several little mixed drinks in the bottle and stash them away in your coat pocket. Personally, I prefer a Mai Tai ands a Whiskey Sour...and this is so you can fortify those pitifully weak drinks they will serve aboard that plane.This is much more socially acceptable than trying to board a transcontinental flight with a pint of whiskey on your person, because the flight attendant wouldn't like that at all! Remember, Islamic terrorists have made air travel infinitely more problematic and you still need to adequately prepare for events that are beyond your control! Next, you should proceed directly to the airport lounge and take a seat at the bar. Sit back and smile, as you order a drink...or two. Sip these beverages slowly, for they are a most important adjunct to mental health and will be a necessary part of your pre-flight preparation. Your mission is to achieve a proper state of mind where any and all consequences of this business called "flying" are drowned out and eliminated from your conscious mind. Forget blood pressure checks and tranquilizers, this is a far more effective remedy to make your flight start out in the right manner. And I must caution you at this point, never drink too much, for you want to walk as normally as possible through the security checkpoint, and not make them think you're "on drugs!" Security procedures dictate extreme caution and they may suspect you of being a terrorist, so you must appear as calm and rational as possible while having enough to drink prior to boarding. Then, when you're seated aboard the airliner, you will be ready for anything. And, since you have visited the lounge and are now "feeling no pain," you won't need to wait for the plane to reach cruising altitude before they will serve you a drink---allowing you to feel completely relaxed during a most important part of your journey: the takeoff run! This is where all your research and knowledge come together, giving you a decided advantage over those who are more naive and merely make a reservation with their travel agent. You are savvy, having stipulated that you will only accept a seat directly behind the wings. This is for two very important reasons: you want to be a competent observer and make sure the crew does everything correctly during the pre-flight check. And, if there is a problem that may result in disaster, the tail section is the last part of any airplane to smack into the ground on an aborted takeoff or a head-first dive! Your primary responsibility upon boarding is to give the airframe at the very least a cursory inspection. There are many places that that can give a reliable indication of fatiguing metal, but the easiest to inspect are the areas around each doorway. So take a few moments to look for cracks in the fuselage around each door frame---and there are usually four of them. Don't shirk your duties: remember, you are not only doing this for yourself, but for each and every other passenger and those on the ground as well, where debris from a disintegrating airplane might "impact" innocent people following a breakup in mid-air because of disastrous depressurization after catastrophic structural failure. Obviously, your responsibilities are many, so politely ask the attendants to open the doors on both sides so that you may check all the places that can present a problem. If you meet with resistance at any point, tell them that you work for the "FAA task force on structural compliance," and do that with a very serious look! Now, as you sit waiting for the flight to begin, the most important thing to watch for is to make sure the flaps and "droops" have been lowered before the takeoff run begins. This must be in evidence even before the plane begins rolling and is typically done after taxiing into takeoff position. Sometimes, the crew will be so busy talking about what they did on Saturday night, or their new girlfriends, they may forget this most important step. You see, the physics of getting a fully-loaded airplane into the sky are awesome---and it is far easier for an airplane to remain in flight than overcome the forces required to boost that whole schmutz aloft! As you sit there, going through your own check list, you watch and listen. If you hear an increase in engine speed---a high pitched whine changing in volume---and, if the flaps and "droops" have not been extended by this time, I'd personally be a little worried and have my hand on the seat belt buckle! And, if the plane started to roll down the runway without the flaps being extended, it is perfectly acceptable to hustle on up front and bang your fists on the crew cabin door---and alert the flight crew to their mistake! They may think you're crazy and have the strongest flight attendant attempt to subdue you, but if you insist the flaps are still up and tell them to look, they might just take you seriously! If all has gone well, the flight takes off and climbs to the desired altitude without incident---somewhere around 37,000 feet---breathe easily and begin to sip your drink. As you sit there, relaxing and imbibing, your next step is a critically important responsibility. So, mull over some of the other things that separate you from the less seasoned air traveler. Prior to buying the ticket, research has told you exactly what is necessary to minimize any mishap that might befall someone less knowledgeable. You have done everything---from surfing the Internet to reading "Consumer Reports"---and you have the inside dope on which airlines have the best safety records. You only want to fly with an air carrier willing to put an adequate proportion of your ticket into regular maintenance and are fully aware that spending a disproportionate amount of money on advertising will never help to keep your flight aloft! Some airlines, you see, have rigorous standards for their mechanics---from drug testing to competency certification---while others just contract out for the work...and you want to avoid them like the plague! Now, as you recline at cruising altitude, you can't help but think of all the terrorist activities that have been in the news. Without being too obvious, take a very careful look around and see just whom you're flying with. If you notice someone in another seat who appears to be a bit suspicious---beware. And, if they make eye contact and have a look on their face that says, "death to infidels," then I'd get a little worried about what might be in the offing! The proper thing to do is get up and pretend you need to use the lavatory. When you're well out of range, inform the nearest flight attendant of your concerns. Please be specific, and say something like: "I think there's a passenger who looks like they might want to go to Damascus!" You will immediately be asked what aroused your suspicions and you'll reply, "He looks like he wants to take over this flight..." The flight attendant will then say something like, "Please go back and sit down...we'll let the captain take care of it!" So, you go back and regain you seat, knowing you've done all you can and the situation is beyond your control. So, look around at the other passengers. What you want to see is someone in a nearby seat who looks like a football lineman. And, if you see a passenger who looks like they could bring down a ball carrier with aplomb, then breathe easier---for, when that swarthy looking person waves a box-cutter in the air to get everyone's attention, you definitely want to have someone big and strong grapple with him---rather than try to do that yourself! But, please let caution and reason prevail. Remember, people from the middle-east travel on scheduled flights just as you or I---and if someone is dressed in bedouin attire, there is a good chance they are simply another passenger, rather than an Islamic terrorist. They might even be the crown prince of Saudi Arabia...but he would be much more likely to be seated in business class than back there with common air travelers like yourself. You need to relax and not jump to conclusions. In fact, after all you've been through---just living in America---you may be crazier than any arab terrorist! So, if your flight continues to be uneventful, increase the rake of your seat back and read, or watch the in-flight movie. The crew up front, who are ultimately responsible for your safe arrival, are some of the most level headed and experienced professionals you ever could hope to find.They are fully trained and quite able to cope with emergencies and deal with any conceivable weather that may be encountered. When you must fly in conditions that are less than ideal, please remember that most airplanes are designed to fly through anything---from hail to tornadoes---and even ice and snowstorms don't faze the captain and this marvelous creation of technology you are riding in. But, you have done your research and really never should book passage on a turboprop when icy conditions are expected. And, before we get carried away---figuratively or, hopefully, not literally---an additional part of your preparation is to avoid taking a "feeder" airline from a small airport. This is very important, because you will never get to your destination if certain conditions are left unmet---like competency in the control tower. Since FAA regulations permit an air traffic controller to work back-to-back shifts if there is no one to relieve them, that's not good. And smaller airports may have unsafe conditions that remain unresolved---like unlit runways and unaware pilots. So, by all means, drive or take a bus to a major airport and only fly out of airports big enough to have adequate activity that may increase your chances of having alert personnel assigned to every step of your journey. Now, as part of your pre-flight check, if the plane was waiting to take off while snow was falling, you want to look out the windows for footprints that signify the pilot or ground personnel did a "walk around" prior to leaving the boarding gate for the taxiway. You see, the problem of sub-freezing weather necessitates the crew being aware of a potential for ice buildup on leading edges of the wings. Once again, if you see those footprints below, circling around the wings and fuselage, then you can relax and know the crew is aware of their responsibilities! More than one plane has hit the overpass on takeoff because of an unfortunate condition that is common to all airplanes: being heavier than what could lift off the runway---even with full flaps and maximum power. And, the awful consequences of such are something you don't even want to think about! But, your flight is proceeding normally and you begin to encounter severe weather during the last part of the journey; don't worry, but do be concerned. If you notice conditions for ice buildup there are additional steps you can take to help the crew in their job. Get up and go forward, to look out a window and examine the leading edge of the wings. Do you see any ice? Be sure to play it safe and check both wings! And, if you are on a turboprop and this kind of weather is encountered, I'd get another drink real fast! When such poor weather is encountered, things slow down, especially in the capability of most airports to handle incoming flights. There may be a delay and your pilot can be asked to circle in a holding pattern while other arrivals are given landing clearance. This is called a queue and most planes carry an adequate amount of fuel to cope with a delay such as this. And, if there is a mishap and a jumbo-jet crashes on landing and closes the runway, relax---for there is always another airport within reach! If you are unfortunate enough to be a passenger on an airplane that has other problems, rest assured that your captain is able to handle most anything. They never serve both pilot and co-pilot the same in-flight meal...that happened in a Hollywood movie once upon a time and regulations were changed! So, if one becomes a victim of food poisoning, the other can take over and safely handle the controls. There is one more thing...of late, there have been many incidents that illustrate a growing number of aging airframes and airliner technology which may have unknown variables. These can result in events not covered by flight simulation exercises or training manuals. Remember, there is a whole fleet of aging 747 jumbo jets with inaccessible and decaying wiring that even the smartest of maintenance crews cannot replace. And, there are 737 airplanes with unexplained rudder problems---so make sure they use clean hydraulic fluid. If need be, go ask the captain and he or she will be impressed with how knowledgeable and thorough an air traveler you actually are. And the A-10 Airbus has a computer controlled system that may force the pilot to wrestle with the guidance system for command in certain situations! So, there is really no advantage to flying in some newer airplanes---you may only be exchanging fatiguing metal and decaying wiring for an overly-complex newer model that can have problems the designers never anticipated! But, rest assured that nearly everyone gets to their destination safely and your paranoia is unjustified. Just remember that, despite everything you see on television and read in the newspapers, and those terrifying airline disaster movies, airline travel is statistically safer than many other modes of travel---except walking---for arabs and infidels alike! So, relax and enjoy the in-flight entertainment, appreciate the marvelous view out your nearest window...and sip your next drink slowly! To read more by Alan Erdman.